Elixir Door and Metals Company Series 8000 Vinyl Steel Housetype Combination Doors are constructed from vinyl laminated galvanized steel which is over sixty percent thicker than the painted galvanized steel offered with the Series 6000. The door comes with weather stripping on both the jamb and the door creating a double seal that protects against air, light, and water penetration. Other features include an optional highly efficient polyurethane foam insulation with high R-Values, a three fin vinyl sweep, an adjustable door stop, a drive-in swivel lock, and a sloped threshold. The storm door, with a built-in drip cap, comes in three options: conventional, all glass full-view, and full-view. The storm door is 1-1/8" thick with a 1/8" tempered safety glass. 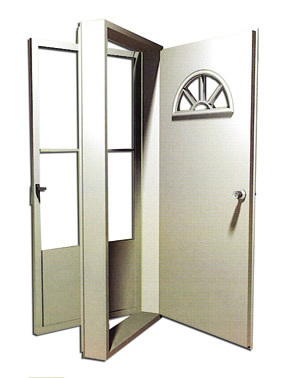 The storm door is available in three colors: mill, white, and bronze. Two additional hardware items also come with the Series 8000: a closure kit and / or safety chain. Other additional hardware items such as a deadbolt and a knocker viewer are also available upon request. Series 8000 doors are available in an assortment of sizes and window options. Please contact your local Elixir Division to inquire about Elixir entrance doors. 32" x 76" 34" x 76" 36" x 76" 38" x 76"
32" x 78" 34" x 78" 36" x 78" 38" x 78"
32" x 80" 34" x 80" 36" x 80" 38" x 80"